In a world first, a donated human liver has been ‘kept alive’ outside a human being and then successfully transplanted into a patient in need of a new liver. So far the procedure has been performed on two patients on the liver transplant waiting list and both are making excellent recoveries. Currently transplantation depends on preserving donor organs by putting them ‘on ice’ – cooling them to slow their metabolism. But this often leads to organs becoming damaged. The technology, developed at Oxford University and now being trialled at the liver transplant centre at King’s College Hospital as part of a controlled clinical investigation, could preserve a functioning liver outside the body for 24 hours. A donated human liver connected to the device is raised to body temperature and oxygenated red blood cells are circulated through its capillaries. Once on the machine, a liver functions normally just as it would inside a human body, regaining its colour and producing bile. The results from the first two transplants, carried out at King’s College Hospital in February 2013, suggest that the device could be useful for all patients needing liver transplants. Based on pre-clinical data, the new device could also enable the preservation of livers which would otherwise be discarded as unfit for transplantation – potentially as much as doubling the number of organs available for transplant and prolonging the maximum period of organ preservation to 24 hours. ‘These first clinical cases confirm that we can support human livers outside the body, keep them alive and functioning on our machine and then, hours later, successfully transplant them into a patient,’ said Professor Constantin Coussios of Oxford University’s Department of Engineering Science, one of the machine’s inventors and Technical Director of OrganOx, the University spin-out created to bring the device from bench to bedside. 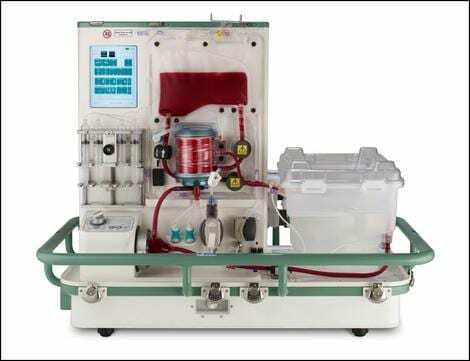 ‘The device is the very first completely automated liver perfusion device of its kind: the organ is perfused with oxygenated red blood cells at normal body temperature, just as it would be inside the body, and can for example be observed making bile, which makes it an extraordinary feat of engineering. ‘It was astounding to see an initially cold grey liver flushing with colour once hooked up to our machine and performing as it would within the body. What was even more amazing was to see the same liver transplanted into a patient who is now walking around.